RBTH presents a selection of views from leading Russian media on international events, featuring an interview with Syrian leader Bashar al-Assad, as well as reports on the problems facing transsexuals in Russia’s jails and Ukraine’s impending energy crisis. The West is conducting an information campaign against Syria with the aim of proving that President Bashar al-Assad is personally responsible for all the country's problems. This announcement was made by Assad himself in an interview with the Russian mass media, which has been published by the Kommersant business daily. Assad said that a similar campaign is being waged against Russian President Vladimir Putin. 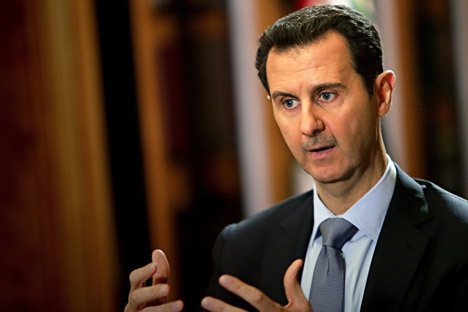 "As to the president, he assumes power through the agreement of the people, through elections, and if he steps down, he steps down because the people demand it, not the U.S. or the UN General Assembly or the Geneva Conference or the Geneva Communique," said Assad, responding to the West's calls for him to immediately relinquish power. In his words, for a long time the U.S. and the EU have been conducting an information campaign whose aim is to "create the impression that the Syrian problem boils down to one personality." The Syrian president also expressed his opinion on the West's policy towards Russia. "What is happening in Syria resembles the current situation in your region,” he said. “Look what happened in the western mass media after the coup in Ukraine: For them President Putin transformed from a friend of the West into an enemy, a tsar, a dictator who suppresses the opposition, who came to power undemocratically, even though he was elected through democratic elections that were recognized by the West." Speaking about the situation in Syria, Assad said that the U.S. government does not want to cooperate with the Syrian government on the fight against ISIS, since from their point of view such cooperation would mean "accepting the validity" of the action of government forces. The Gazeta.ru online newspaper writes that Muscovites are following the fate of transsexual Alina Davis (Dmitry Kozhukhov), who was recently detained by police for possessing 12 grams of amphetamine. Kozhukhov gained notoriety after officially marrying his girlfriend in August 2014 at a ceremony in which both partners wore white dresses. Possession of such a quantity of drugs is punishable with a three- to ten-year prison term, although Kozhukhov was released on condition that he does not leave the country. According to sources at the law enforcement agencies, inspectors had difficulties assigning the suspect to an appropriate jail. "In his documents Kozhukhov is a man, but in life he defines himself as a woman," says the source. "Due to this confusion, inspectors were not able to determine which jail he should be sent to." It is dangerous to send a transsexual to a men's prison, while women's prisons do not accept those who are indicated as men in their passports. In the end the inspectors were able to have Kozhukhov cooperate with them. Kozhukhov himself said that he had already been released from police custody and confirmed that one of the reasons was precisely the police's indecision about the type of jail he should be sent to. Maria Kannabikh, a member of the Russian Presidential Council on Human Rights, noted that jails usually do not contain these type of people, but nevertheless they can be found there. "Occasionally human rights activists propose legislative initiatives to give this type of people a legal status and then create special sections in prisons for them. But for now all of this has just been talk," she said. The Vzglyad online newspaper cites Ukrainian Deputy Prime Minister Valery Voschevsky as saying that Ukrainian energy is in a "pre-coronary condition," while the government has lost control of the situation. "Moreover, the government is not in command of the energy situation," he added. The cause of the upcoming catastrophe, according to Voschevsky, is the political showdown between President Petro Poroshenko and Prime Minister Arseniy Yatsenyuk. "The contradictions between the two leaders of the government are so clear that they are tearing apart not only the energy sector but Ukraine itself." Indeed, a month before the heating season the country has found itself completely unprepared for the upcoming winter. Kiev, convinced that its reserves of gas from Europe were sufficient, refused to buy gas from Gazprom. Kiev also did not want to buy coal from the self-proclaimed Donetsk and Lugansk people’s republics of eastern Ukraine, thinking that it would look bad if it financially helped the uncontrolled territories while it was blockading them economically. Another reason for the insufficiency in coal is that Kiev has started closing state mines. "The 2014 experience showed that the reduction of coal volumes has a direct impact on the electrical supply in apartment blocks and private houses. In the second half of last year millions of Ukrainians throughout the country were left without light and it seems that the situation will repeat itself this year," said Alexander Koltunovich from the Ukrainsky Vybor social movement.